This book is a complete and utter but strangely beautiful mess – at least structurally. But then there are different editions to this book and depending on which edition you picked up, it either starts with the story of George or the story of Francescho. No matter which one it starts with, both stories are intertwined and both stories – though very different – toy with the idea of how opposing concepts can be combined. Luckily, my journey started with George. 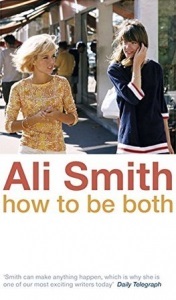 Luckily, because Smith’s ambitious project would have confused me even more than it already did if the story had begun with Francescho’s story and had lacked the introduction to the concept of duality that is introduced by George’s dialogue with her mother.